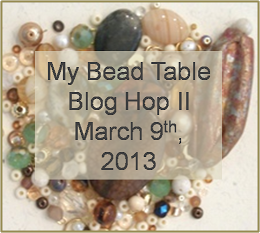 Busy mixing my soup for the Bead soup blog hop and working on my Sand and sea blog hop. My first hops and I am excited and scared. Am I up to the challenge? On another note- my employer has given in on the all or nothing attitude they usually have-- they will let me go back part time with restrictions so I may have less time than I thought for these blogs... it is a mixed blessing- I need the income as I am running out of sick and vacation time, but not only will I have less hours, but I will be tired during those hours and will have to spend a portion of it with my foot up due to swelling from the use. Can't wait to see your teaser piccie. What reveal are you in? I'm trying to visit as many of the bead soup blog party blogs as possible. Can't wait to see updates on this!